TS ECET Rank Card 2019 Available here. Candidates who are qualified in Telangana State ECET Exam 2019 can get the Rank Card and Percentile now. Aspirants can download the TS Engineering Common Entrance Test Rank Card 2019 instantly on this page. Also, refer TS SCHE Official website ecet.tsche.ac.in for any other doubts. 1.3.1 How to download Telangana State ECET 2019 Rank Card? 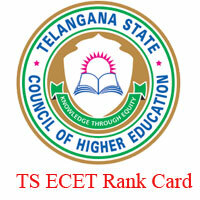 The Telangana State ECET Rank Card is an important thing while going for the Counselling. So, aspirants must download the TS ECET Exam Rank Card before the Counselling. Without the Ranks Card Copy, candidates will not allow for the TS ECET Counselling 2019. So, it is clear that the ECET Rank Card is very must and should think. For this, candidates need not search for more websites. For your convenience, we have provided the direct link to download the TS ECET Exam 2019 Rank Card. So, candidates can go below for ease of TS ECET Rank Card Download. Firstly, TSECET is known as Telangana State Engineering Common Entrance Test. As we all know, TS ECET is a state level entrance exam for the diploma holders and B.Sc (Mathematics) holders. Through this TS ECET Exam, students can get the admissions into the 2nd year B.Tech in best engineering colleges in Telangana. Kakatiya University, Warangal has conducted the TS ECET 2019 successfully on behalf of the Telangana State Council of Higher Education (TSCHE). Candidates who had completed the Online Application Process before the last date had got the TSECET Admit Cards. Almost, all applied candidates have appeared for the Telangana State ECET Exam 2019 as per their admit cards. KU has announced the TS ECET Results recently. A huge number of candidates have qualified in the Telangana Engineering Common Entrance Test. Now, Kakaktiya University has released the TSECET Rank cards for the qualified candidates. Name of University Kakatiya University, Warangal. Exam Name Telangana State Engineering Common Entrance Test. Examination Level State Level Entrance Exam. Date of Exam May 2019. The TSECET 2019 Notification released a few months back. A huge number of diploma holders and Degree (Maths) holders have applied for this exam to get direct admissions for 2nd year B.tech in the best engineering colleges in Telangana State. Kakatiya University has scheduled and conducted the TS ECET Exam for applied candidates a few days ago. KU has corrected and released the results also. Now, it is the time to check the TSECET Results and to download the Rank Card. So, candidates must download the Rank Cards for TS ECET Exam 2019. The Telangana State ECET Exam 2019 Rank Cards are also available at the official site that is ecet.tsche.ac.in. So, Willing candidates can download the TS ECET Rank Cards from the official website also. We have provided easy steps for the TSECET Exam Rank Card Downloading process. So, candidates who have a no idea about how to download the Telangana ECET Rank Card from Official Site can get an idea now. Then check for the TSECET Rank Card Download Notification on the home page. Different options will display on the screen. Enter the Login ID & Password details. Your rank card will be displayed on the screen. Candidates can download the TS ECET Rank Card 2019 with one click to save your time. We have provided the direct link for the TSECET Exam Rank Card 2019 Download. So, candidates just click on the link and enter your hall ticket details. Aspirants will get the Telangana ECET Rank Card 2019 instantly. Applicants can stay in visiting this website to get the further updates such are TSECET Counselling Dates, Allotment Order Download. when u r going to release the results?dont be late display as soon as possible. Really fed of by this stupid govt. This is not fare doing this way..how long u will take to release the results..
Release the ts ecect results…. I lost my Login ID.. how can I get it back.. could uh please help me.! can u please tell when will be the results released?